Ralph Minkus, age 93, of Grand Rapids, went to be with his Lord on Wednesday, July 4, 2018. 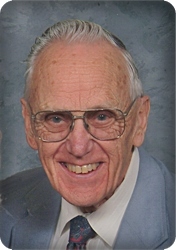 Ralph served in the U.S. Navy during WWII and worked for the City of Wyoming, retiring in 1991. He will be lovingly remembered by his wife of 71½ years, Norma; sons, Craig (Gayle) Minkus, Mark (Jody) Minkus; grandsons, Ryan (Kari) Minkus, Jason (Juanita) Minkus, Matthew (Meaghan) Minkus; brother, Donald (Maxine) Minkus; and several nieces and nephews. The family will greet visitors on Monday, July 9, from 4–7 pm at Stroo Funeral Home. The funeral service will be held at 11 am Tuesday, July 10, at Grace Lutheran Church, 150 Fiftieth St. SW, Rev. John Diener officiating. There will be an hour of visitation prior to the service from 10–11 am at the church. Interment will be in Holy Corners Cemetery. In lieu of flowers, memorial contributions may be made to Grace Lutheran Church.